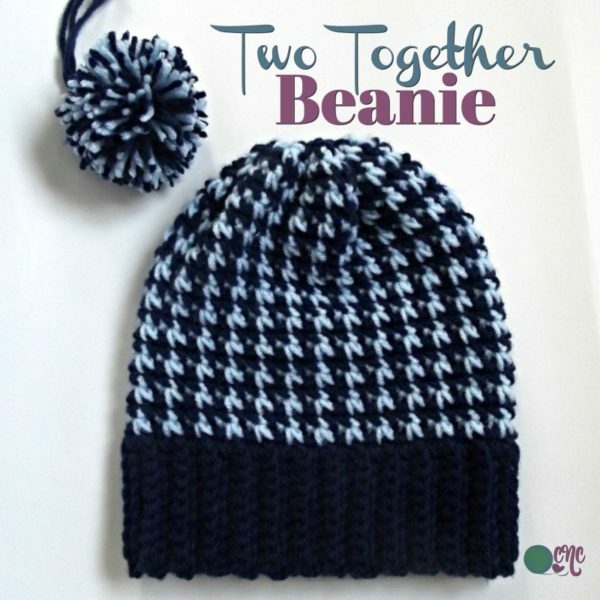 This beanie is not only easy to crochet to any size you need, but it’s also got a pretty color-tone. And you have the option to make a pom pom or to leave it off. For this hat, I tried to do a happy medium on the length for a 6-12 month old so that I could fold the brim up for extra warmth around the ears, or to leave the brim down for a slight slouch at the top. You decide how long you want to make it. It’s mindless and fun, and perfect for both men and women. Another pattern suitable for everyone is this pom pom beanie. Yarn: Red Heart Super Saver (Worsted Weight (#4) 100% acrylic, 7 oz/198g – 364 yds/333m) – 2 Colors – CA = Soft Navy, CB = Light Blue. Gauge Across Ribbing Rows: 4 sts = 1″ and 14 rows = 4″. Gauge however is not important as the hat can be adjusted to any size as needed. Finished Size: Laying flat it measures 8″ across and 8.5″ long. However, it can be crocheted to any size as desired. Carry unused yarn up at each Rnd. Here is a short tutorial on how to make a pom pom. Rows 2-52: Ch 1, blsc in each sc across. Turn. (9 sts) Continue with this row until you have reached a desired circumference making sure to end in an even number of rows. Rnds 4-21: Rep Rnds 2 and 3 consecutively for a total of 21 rounds, or until you have reached a desired height for hat. Fasten Off CA leaving a 10″ tail. Weave tail end in through last Rnd and pull tight to close the hole. Optional: Make a pompom and attach it to the top of hat. This is the first in the series, but more patterns to come in the Two Together series. And you might want to check out more crochet hats at CPB. Or, check out this roundup of crochet winter hats.